This map viewer illustrates the scale of potential coastal flooding after varying amounts of sea level rise. Users can simulate inundation associated with one to six feet of sea level rise at various scales along the contiguous United States coast, except for the Great Lakes. The maps are produced using detailed elevation maps with local and regional tidal variability. They show the extent of inundation likely at high tide after various amounts of sea level rise. Take a preliminary look at coastal areas likely to be inundated at high tide by various levels of sea level rise. Visualize the impacts of sea level rise and prioritize actions for different scenarios. Use the five tabs at the top of the legend—Sea Level Rise, Confidence, Marsh, Vulnerability, and Flood Frequency—to explore visualizations of each category. Use the slider bar (on most tabs) to examine the impacts of different sea level rise scenarios. Read the overview text directly below the legend to learn about individual impacts. Look for additional information below the legend in the left navigation pane. 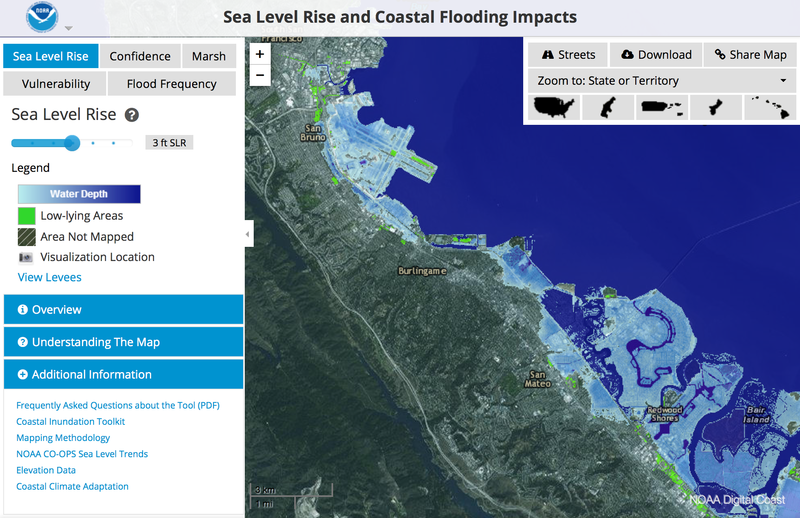 Mapping Sea Level Rise and Coastal Flooding Impacts Robust online viewer. Opportunity to download mapping files by state. This short article includes a 2-minute video about using the tool.